Edit: Actual build begins on page 4 of this thread. Everything before this is just my thoughts/ideas about what I wanted to build. As I prepare for my build, I thought I would start a log to keep track of things. 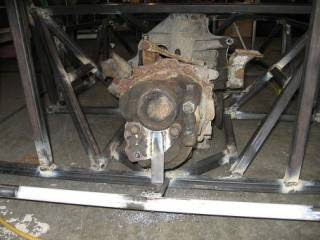 Option #1 A standard frame, holding an Audi 10v (or possibly a 20v N/A) mated up to a Porsche 924/944 rear mounted transmission. Option #2 Audi 5-pot, with the quattro transmission in it's standard location. I would omit the front axles and lock the "center" diff (located in the trans) thus turning it into a RWD setup. While this option would likely be cheaper, the weight would be further forward, and I would have less leg room compared to option #1. Option #3 Building from the Vodou plans using a Miata donor. This would be straightforward without having to jump through hoops to get the mechanicals to work together. 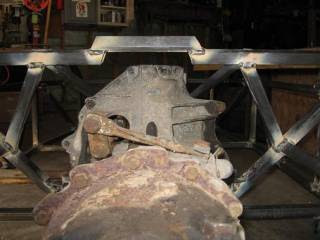 Local Miata donors pop up once in awhile, and I like the design of the rear frame on the Vodou plan. 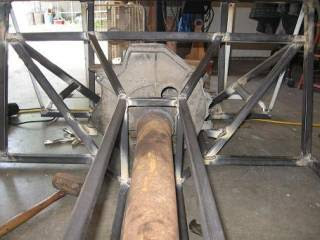 Option #4 standard frame using an S-10 donor. Cheap and easy to find parts, but part on my soul would be sad... I've never been much of a fan of Chevy or Dodge... I could maybe do a Ranger... but I've been a Euro guy all my life. Goal for the car is to have a fun fair weather street car, occasional Auto-X is possible, but the majority of the time it would be street driven. I am not too concerned about weight, if it's around 1500lbs I'll be very happy. I want to be able to fit everything really easily and I love the wider look, so I will go with a 442E. Also not too concerned about power, because even 100hp in such a light car will be fun. I want to be able to drive the everliving piss out of this thing, and still be within the realms of a normal speeding ticket. The engine/trans setup will actually be almost completely bolt up. As many of you know the Porsche 924's used Audi manufactured 4-pot engines. The bell-housing will bolt up to the Audi inline 5, using a factory 11mm spacer. 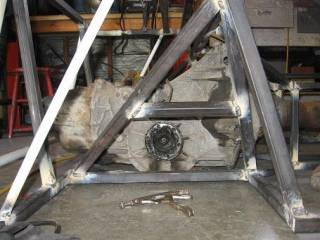 I can then bolt the 944 torque tube and rear trans to that. From my research so far I will need the following. I know the Audi engine is a bit on the heavy side, but my thought it that a rear trans layout will even it out a bit. Also, my goal isn't to have a featherweight. Fingers of butter and fists of ham. Last edited by OptimusGlen on February 1, 2012, 12:30 pm, edited 3 times in total. Another project that looks like it was shelved. VW engine with the Porsche rear trans. I saved some images, re-hosted them, and am posting them here. 924 bell housing mated with an Audi 20v engine, if you look close you can see the 11mm OEM spacer. This is from the 944/Audi 20v project listed in my first post. 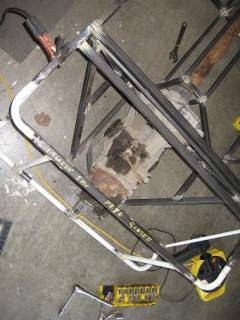 You can see the spacer more clearly here, also note the custom oil pan was to clear the 944 subframe. old-school power hack saw, first project is building a roller-stand to support longer tubes as they cut. I'll tack it all with gasless wire. By the time I'm at the point for final welds I will probably pick up the gas kit. Unless I feel confident in welding it up and dealing with slag and spatter. A little about myself. I am a mechanical designer at a leading Medical device company. I'm 29 and I've been into cars since I still pooped my pants. I've had a lot of project cars over the years, 6-VW's, 3-BMW's, 2-Audi's, and 2-Volvos. 2 of those were cars I built from a bare shell, swapping engines and adding forced induction. Decided it's time for a dedicated project/fun car, need to stop throwing money at the daily drivers. As a mechanical designer I work with Pro/Engineer every day, so I can model anything up I need to. In fact, once I get the drivetrain parts I will probably model them all to check for clearances etc. I've wanted to build a Locost for many years, as evidence, my first post here in 2006 where I boasted some big plans. This time I have my reality check hat on. Last edited by OptimusGlen on February 1, 2012, 12:31 pm, edited 1 time in total. It's great your staying with it. I'm glad this forum is still a draw for you over many years, that's a good sign. I'm going a similar route to the one your interested in. It's just starting and this is the preliminary thread, "My messy new shop" , http://locostusa.com/forums/viewtopic.php?f=32&t=12980. I'm doing it in Google Sketchup so more people can find the material accessible. I've put some shelving in the background and am hoping to store a variety of different components there that people will be able to swap in and out. So I'm modeling a shop instead of just a car, because I like abusing software. I'm going for VW, Porsche traditional transaxles and am hoping to be able to run the flywheel and starter motor in the back too. I think the 924 unit is a little problematic because it appears to have a large distance from the half shafts forward and will intrude into the driver's hip area. The VW / Porsche units are good because they have nice symmetrical bell housings and can run right side up or upside down. Good for ride height choices between street and track cars. These units can also have their ring and pinion flipped so people could run reverse rotation Hondas if they wanted. I am not thinking to run the torque tube, just CV joints and supporting the shaft with a bearing or two. My frame uses a minimal tunnel structure at the moment too. I would loose the rear trans idea. For what thats going to cost you can go with a proven set-up by bolting that engine to the T5. A rear trans is a proven setup. .. which explains the ready availability of parts. One of our members even used an Alfa as I recall. The Alfa transaxle is hard to use, since it's very long and the diff is at the back end. You would need a very wide tunnel. Use the rear transaxle!! You will get more rear weight bias and much better foot room. And that didn't even begin to address the width it needed. Wait!?!?!?! An MG with an Alfa transaxle??? MG and Alfa Romeo parts, together in the same chassis? I think rear transaxles are at least potentially a very good idea. Glen may or may not persist with it. I read thru the thread your pointing at and I think this reinforces my thoughts. Once we get a working solution for this it makes the adapter problems go away. You do get a new adapter problem, but it is the same for all engines. It should improve the handling by putting more weight on the rear wheels. That's hard to do on these cars. Transaxles are also a good amount lighter then a transmission + a diff, also a difficult thing to do. Not sure about the cost your concerned about. Passat transaxles are not that expensive.